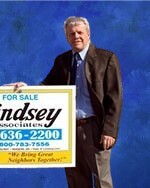 I'm excited to again be a part of the real estate industry in Northwest Arkansas. As a native of Bentonville, and a resident of Rogers for over 25 years, I haven't been "told" about the amazing growth of the area, I've witnessed it first hand. Whether you're considering selling or purchasing, there is no substitute for true knowledge of the area. I welcome the opportunity to meet and assist you with achieving a well informed real estate transaction.